Zantedeschia aethiopica (L.) Spreng., Syst. Veg. 3: 765. 1826. Calla aethiopica L., Sp. Pl. : 968. 1753. Colocasia aethiopica (L.) Link, Diss. Bot. : 77 (1795). Otosma aethiopica (L.) Raf., New Fl. 2: 90 (1837). Arodes aethiopicum (L.) Kuntze, Revis. Gen. Pl. 2: 740 (1891). Pseudohomalomena pastoensis A.D.Hawkes, Madroño 11: 147 (1951). Govaerts, R. et al. 2018. Zantedeschia aethiopica in World Checklist of Selected Plant Families. The Board of Trustees of the Royal Botanic Gardens, Kew. Published on the internet. Accessed: 2018 Nov. 09.
International Plant Names Index. 2018. Zantedeschia aethiopica. Published online. Accessed Nov. 09 2018. The Plant List 2013. Zantedeschia aethiopica in The Plant List Version 1.1. Published on the internet. Accessed: 2018 Nov. 09. Tropicos.org 2018. Zantedeschia aethiopica . Missouri Botanical Garden. Published on the internet. Accessed: 2018 Nov. 09. 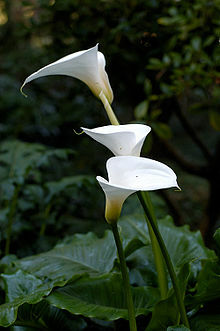 For more multimedia, look at Zantedeschia aethiopica on Wikimedia Commons. This page was last edited on 3 March 2019, at 00:53.